The Model 3300 TDR, Cable Fault Locator, is one of the fastest, most accurate test methods for locating problems on twisted pair cable. The instrument''s easy operation and field durability make the Model 3300 a valuable troubleshooting tool. 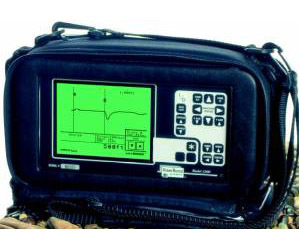 Model 3300 is a handheld metallic TDR designed specifically for fault locating in a variety of twisted pair cable applications, such as telephone, LAN, signaling, utilities, and avionics. Designed for easy operation and engineered for accuracy, Model 3300 tests for opens, shorts, sheath faults, broken or loose conductors, load coils, bridged taps, water damage, crimps, cuts, smashed cables, and more!